Taking kids on outdoor adventures is usually fun and often rewarding in different ways, but it is always more work. 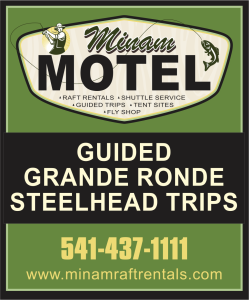 I had been hankering to take our boys on a winter steelheading, rafting, and camping trip down the Grande Ronde this year. I had almost taken them in January when it looked like the weather was going to be slightly nicer, but I did not have a winter worthy tent big enough for the whole family. I did some looking around and finally bought a good large tent on sale that would fit the whole family, was quick to set up, quick to take down, would not blow over or collapse in the middle of the night from a strong wind, and would keep us dry if it rained or snowed all night. I have had cheap tents fill up with water like a bucket when it rains all night and flimsy ones that have blown over on me in the middle of the night, but I wanted something a little better for our first winter camping trip with the kids. 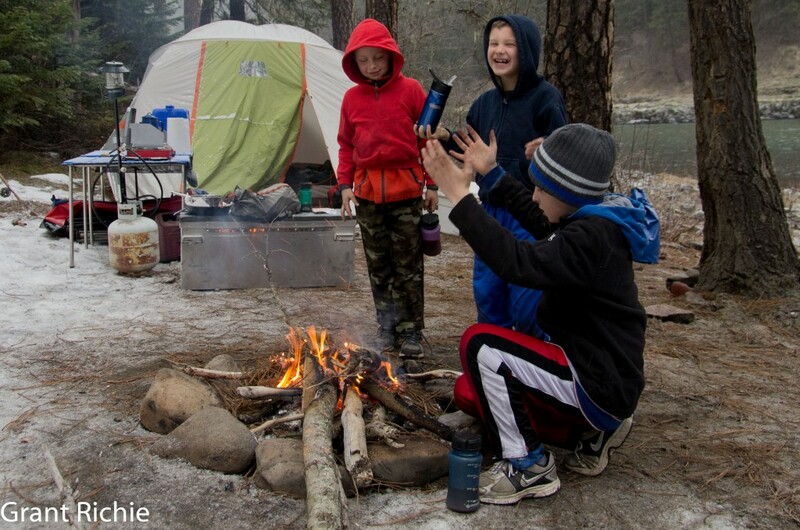 I do think slight hardships that the kids can overcome with a little effort build character, but I did not want to risk souring them to winter camping for the rest of their lives either. Or for that matter endangering them since we would be miles away from any roads or other people. Now the tent excuse would not keep us from going winter camping, but each Saturday in February the boys have been playing youth basketball. Four or five days before February 20th I realized that it was President’s Day. Better yet our work load was such that I could also take the holiday off so Lottie and I quickly planned a two day getaway as soon as the kids basketball game was over early Saturday afternoon. I was excited. I had taken the boys steelhead fishing/rafting/camping last fall but my wife wasn’t able to go. With two adults I thought I would be able to do a lot more picture taking, which I have come to really enjoy lately, and I might get a little more fishing in as well with another adult to help row and make/break camp. Now don’t get me wrong, everyone has to help on our trips including the kids. That is just part of being a family, but to be frank I can often do the things faster if I had simply done them myself rather than showing and helping the boys do it. Saturday came and with it the basketball games. We hadn’t been able to get everything ready but as soon as the games were over Lottie made a last trip to the store to get groceries for our trip while I loaded the pickup. My wife called me from the store with good/bad news. Someone wanted to rent a raft for a multi-day trip Monday morning, but that meant she would not be able to go rafting. My heart sank a little, although there were times earlier in our relationship that I felt she slowed me down and got in my way, we have worked out our own way through trial and error how to enjoy hiking, camping, and fishing trips together. Lottie has even joined me on multi-day hikes into and harder yet, out of Joseph Creek which many others would not be capable of. Another variable I had to consider this time was myself. My back had been going into spasms on a regular basis for a few days and I was on a regiment of ice and pain killers. I was feeling slightly better but each night when I tried to roll over or get out of bed I was racked with pain as my back went into another spasm. I decided I could do it if the boys were strong enough to help me carry the dryboxes and coolers. We took a vote and the kids decided they still wanted to go on a rafting trip so we began to repack the pickup to adjust for one less adult and three less dogs. I was perfectly comfortable taking three kids down the Grande Ronde in the middle of winter, but I didn’t want to worry about dogs as well. At least not our Jack Russels. I never have to worry about our border collie Molly, but the raft was already going to be a little crowded so we decided to leave the dogs at home. We headed to Minam but still had to get a raft unpacked, inflated, and set up. When I started rowing down the Wallowa I had less than an hour of light left. We made it around three miles to the first camp site and as we began to unload the raft it was getting dark. We had to get out our headlamps and made camp in the dark. We hadn’t set up the new tent yet (a Kelty Hula House 6 which will be available to rent with rafts from Minam), but it was quick and easy even by the light of our headlamps. With our tent pitched, dinner made, boys fed, we made our way into the tent and I taught the boys a card game. Kolby, who is the oldest and often able to stay up the latest, began falling asleep not too far into our card game and we had to keep prodding him to wake up and play a card. Once the hand was finished we decided it was time for bed since it was a 4 player game and one of the four players couldn’t keep his eyes open. 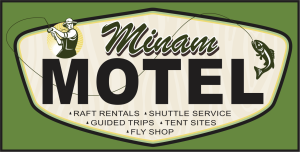 I had ordered a few nice sleeping pads from NRS that were nice and thick and sturdy with the thought that we will rent them out at Minam as well, but they didn’t show up in time for our trip. Instead I used an older Coleman air mattress that had not leaked previously. It started leaking that night, but not so bad that I was completely on the ground in the morning. My back felt surprisingly good in the morning even with the half inflated mattress. It had gotten down into the 20’s Saturday night, but I brought two sleeping bags for everyone and no one got cold. Sunday we took our time floating the last 6 or 7 miles of the Wallowa and stopped to fish two spots. I had watched someone hook and land a steelhead about two weeks earlier in a slot that I had passed over many times and not fished. It is one of those spots that is easy to miss if you are not paying attention and is somewhat in the middle of the ten miles between Minam and Rondowa and I have spent less time fishing this section. Having it brought to my attention, it was a good spot that the kids could fish easily as there was a shallow gravel bar and then a deep shelf just beyond it. Long casts were not required here. I slowed the raft down and then hopped out in the shallow gravel bar to hold the boat and let the kids out to fish. I then waded the raft over to the bank and let them fish the slot. They all fished it and then I took my turn and first caught a couple of rainbows and then hooked and fought a steelhead. The boys decided they hadn’t fished the slot enough and went back to the top to give it another try. No more success from the new slot was found and we headed down the river. I didn’t stop the raft again until we were down the Grande Ronde a ways and it was getting close to evening. This time we had enough daylight to pitch camp and just enough left over to fish the good looking run in front of our camp. The kids gave up fishing quickly as they had been getting some fishing in as I rowed. I however did not feel like I had even warmed up my casting arm and gave the run my full attention for the short amount of time there was still light. Not long into the run I hooked and landed a wild steelhead on the Simple Egg pattern. I tried to hand the camera to one of the kids to take a picture of it, but she got away before we could snap a shot off. My success once again brought the kids attention back to the river and they decided to fish it a little harder. I yielded the river to the boys and went to begin cooking dinner. The night was getting colder and I knew the weather forecast had called for overnight temperatures in the low 20’s. The boys wanted to make a fire and they had gathered what they called “firewood”. I looked at what they had found and it looked to me like a small pile of kindling that would last 20-30 minutes at most. I tried to explain the difference between kindling and firewood and they went off again. Next they came back with a few pieces of sopping wet rotten wood. And this is why it is often faster to do things yourself. I went with the boys and picked good dry driftwood from the rocks that they could carry back to camp. With a long enough walk upstream we found a good pile of driftwood that had collected during high water last spring and we had a good supply of firewood. With dinner served the boys argued about the best way to roast a marshmallow and then showcased their different techniques. Camping is good for kids. Where else do they get to start their dessert on fire without the risk of burning down your house? Winter is even better as there is snow surrounding your fire and it is hard to start a forest fire. Monday morning the weather began to get very scenic with big heavy snowflakes. After breakfast we all tried to get our frozen waders and wading boots on. It was impossible. We took our boots and waders down to the river and threw them in the shallow water so they would thaw out. The waders thawed fairly quickly, but the boots were much slower to soften. It was a cold morning and I had a good 26 or so miles to row out. The boys fished a little but decided it was too cold. I noticed Mason and Brenden were not wearing their gloves and I suggested that they put some on to stay warm. I had supervised their clothes packing and had them bring two sets of gloves: a lighter pair for in the boat that they could manage to fish with and a heavy set of snow gloves for around camp or when they were not fishing. They now informed me that they had left their gloves in the bottom of the raft all night. Both sets, so the gloves were currently only capable of being blocks of ice. I chastised them for a minute suggesting that the next winter raft trip they would listen to me and keep one set of dry gloves and perhaps bring the wet gloves up to camp to dry near the fire at night. After I was pretty sure the lesson was learned (and I am never really sure the lesson is learned) I pulled the raft over and got out some chemical hand warmers out of my pack. This helped, but they were still getting cold and after a while I pulled over and brought out my backup: Jeff’s propane heater. That heater is great. It is small enough that it fits into a dry box nicely and you can either screw a small green propane bottle into it or hook a hose up to it from a bigger propane tank. I had brought one green propane bottle for quick warm-ups just in case someone went overboard and got wet. Or in this case if they were just too cold. The kids ate a little lunch crowded around the propane heater and pretty soon they were laughing and giggling like happy kids again. The heater will shut off if it gets tipped over and I wasn’t sure it would stay on in the raft, but the kids carefully got in the raft with it and they had a new fun game: keep the heater steady enough to keep running and not so close it melted your clothes. We went through several good sized waves and the heater never shut off and they managed not to melt any of their clothes. The weather also began to warm a little. Soon they were back to fishing and harassing one another if the other person fished too far into their section of water. With three kids fly fishing in a raft it can feel a little crowded, but they did good at not getting in each other’s way too much and most importantly not hooking me as I was rowing. They have gotten some practice at casting from a raft and yielding to each other if someone else has already begun to cast, but I was especially impressed out how well they did since this was their first trip using switch rods. I built several switch rods this winter. With five people who like to fly fish, I have to keep a lot of rods around now with a spare or two just in case one gets broke. 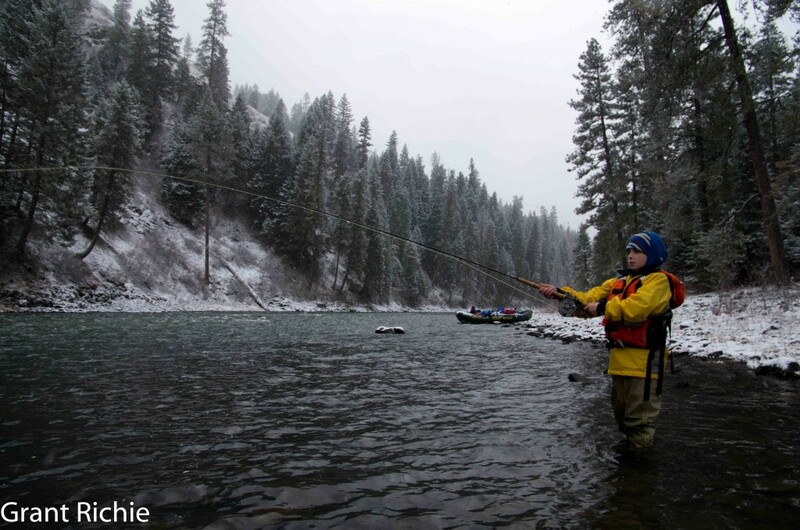 But the Grande Ronde is a good switch rod river too. A single handed rod can feel a little limiting sometimes, but a good 7 weight switch rod can handle the distances without too much trouble. The kids began to get the feel for casting two handed with just a few hints of instruction and they were covering the water much better than they have in the past with single handed rods. I had planned everything just about right for maximum time on the water and we arrived at Powwatka bridge with about an hour of daylight left. With the rowing, cooking, cleaning, making camp, breaking down camp, and keeping three boys in line . . . I did not get to take near as many pictures as I would have liked nor fished as much as I would have liked. But we had a great time and soon I will have them trained to row good enough that I can get some fishing in on the boat as well. Jeff has taught me a new trick and you can click the picture below for a photo gallery from the weekend. This entry was posted in Grande Ronde River, Wallowa River and tagged boys, camping, fishing, grande ronde, kids, rafting, steelhead. Bookmark the permalink. Your boys are going to have memories that will last a life time for sure. Awesome job with them, and a great write up. I always enjoy reading your posts. Thanks Tony, it is good to hear from you.